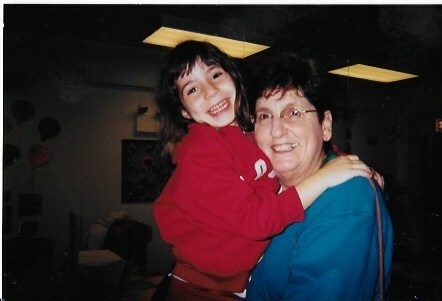 A preschool-aged Karli Goldenberg and her Bubbie embrace. There are about 481 miles between my hometown of Skokie, Illinois and the Tree of Life Congregation in Squirrel Hill, but they felt much closer on the morning of Oct. 27. The families of the 11 victims who came to synagogue to pray will instead say prayers of mourning. Six others were injured. Though I do not personally know any of the victims of the shooting, I feel for them and their community. It feels like half of my heart is in Squirrel Hill. Growing up in Skokie, I was surrounded by many Jewish friends, families and teachers. It was my normal. In 2017, 28 percent of the population of Skokie was Jewish, according to Chicago Magazine. The daughter of a Jewish father and a Roman Catholic mother, I felt at home in Skokie. In stark contrast to Skokie, only about 1.76 percent of people in the U.S. are Jewish, so you could say that I grew up in a kind, loving bubble, completely unaware that anyone could hate someone for being Jewish. I knew nothing of hatred and anti-Semitism, and I spent my childhood believing that many places just like Skokie existed across the country, not realizing until I grew older that Skokie is more of an anomaly than a norm. For context, growing up, I even believed that Yiddish words were English and that everyone could understand them. Many of the adjectives that have reappeared constantly in the coverage of Squirrel Hill could just as easily be used to describe Skokie: “tight-knit community,” “safe,” “a family,” and a great place to raise a family. Over the past, nearly, two weeks, I have felt nearly every kind of emotion, from shock, pain and sadness to hope and pity, and I was not alone. My Facebook and Twitter timelines showed article after article that put the pain and carnage in my mind. It was inescapable, and it still is. As more information came out, the names and ages of the victims were released, and my stomach sank further. All 11 victims were older, and as their ages flashed before my eyes, all between 54 and 97, I could not help but see my Bubbie and Zadie in each and every one of them. I see my dad in them, I see my aunts in them, I see my uncles in them, and I especially see my Bubbie, Zadie and great-grandmother, who we lovingly called “G.G.,” in them. The oldest victim, Rose Mallinger, 97, even shares the same first name as my great-grandmother from Kiev, Rose Bender. I see my family in them, and I see half of myself in them. 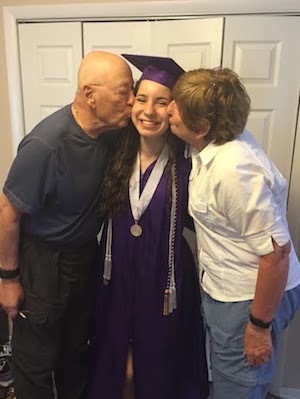 Karli Goldenberg's Zadie and Bubbie kiss her after coming home to celebrate her high school graduation. My great-grandparents left Ukraine, seeking refuge and safety from the danger they experienced in Kiev (Kyyiv) and Odessa, but generations later it is painfully obvious that violence persists, even beyond the pogroms. In 2017, the same year that white supremacists in Charlottesville, Virginia., armed themselves with flaming torches and chanted, “Jews will not replace us,” anti-Semitic incidents in the United States saw a 57 percent rise, according to the Anti-Defamation League. In New York alone this year, anti-Semitic incidents have risen 22 percent since 2017, according to Bloomberg News. After much pain and reflection, I can honestly say that I pity the assailant, Robert D. Bowers. I pity him for knowing nothing of the beauty and love within the Jewish community. I pity the fact that he never had the joy of learning about doing a mitzvah. I pity that he never felt the love of a Bubbie. I pity that he never felt the support of a Zadie. I pity that he has never known the joy of a Bar or Bat Mitzvah, nor heard prayers echo through a synagogue. I pity that he never got to experience a Passover Seder. I pity that he never got together with friends and family for Shabbat. Above all, I pity the fact that he will never truly understand the community he hurt. But, beyond feeling pity, I am overwhelmed by gratefulness. I am grateful to be a part of a campus that came together and held a vigil. I am grateful for the Muslim community’s love and generosity, raising over $200,000 in the wake of the shooting through a LaunchGood site titled "Muslims Unite For Pittsburgh Synagogue." I am grateful for every single person who expressed support or showed love in the face of tragedy. At the vigil in Pittsburgh for the Tree of Life, Jeffrey Finkelstein, president and CEO of the Jewish Federation of Greater Pittsburgh, gave a powerful response to the death of the 11 victims. “The traditional Jewish way to respond to news about the death of an individual is to say, ‘Blessed is the judge of truth,' or in Hebrew, ‘“Baruch dayan ha'emet.’ And when 11 people are slaughtered, we say it 11 times. “Baruch dayan ha'emet. Baruch dayan ha'emet. Baruch dayan ha'emet. Baruch dayan ha'emet. Baruch dayan ha'emet. Baruch dayan ha'emet. Baruch dayan ha'emet. Baruch dayan ha'emet. Baruch dayan ha'emet. Baruch dayan ha'emet. Baruch dayan ha'emet,” Finkelstein said. Joyce Fienberg, 75. May her memory be a blessing. Rose Mallinger, 97. May her memory be a blessing. Bernice Simon, 84. May her memory be a blessing. Sylvan Simon, 86. May his memory be a blessing. Cecil Rosenthal, 59. May his memory be a blessing. David Rosenthal, 54. May his memory be a blessing. Richard Gottfried, 65. May his memory be a blessing. Jerry Rabinowitz, 66. May his memory be a blessing. Daniel Stein, 71. May his memory be a blessing. Melvin Wax, 87. May his memory be a blessing. Irving Younger, 69. May his memory be a blessing.